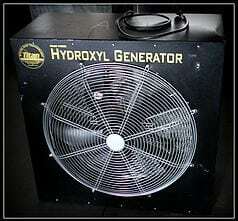 The hydroxyl generator safely purifies and deodorizes the air in buildings. It is completely safe so your customers, staff or family can stay in the building while it’s running. 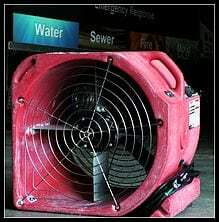 The Centrifugal Air Mover is a high powered fan that can quickly dry an area of a building damaged by water. 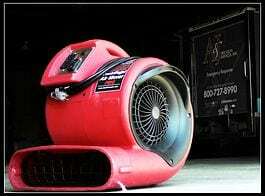 It is durable and has a minimal amp draw, allowing a typical house circuit to handle up to four air movers at a time. The Axial Air Mover is perfect for those hard-to-dry areas. It’s great for great for carpet or flooring and reaches up to 23 feet. It also draws less than 2.5 amps while running on high. 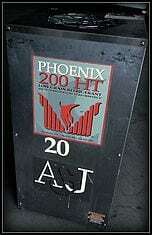 The Phoenix 200 HT LGR Dehumidifier can fully function in temperatures up to 120°F. Older models can only function at 90°F. This allows for maximum speed and effectiveness in removing moisture from the air of your building or home. How can you be confident it’s dry? We’ll advise you on how to properly set up the equipment and when you think it’s completely dried, we’ll come and take measurements to make sure the problem is completely taken care of.